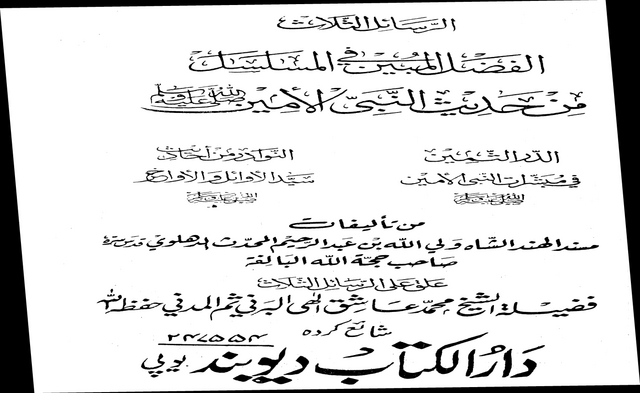 The following is a scan from one of the Athbat (a book listing his chains of transmission via his teachers) of the Imam al-Hind, Shah Waliullah Muhaddith al-Dehlawi (d. 1176 AH), and his transmission of a unique musalsal sanad (patterned chain of transmission) which contains some famous Asharite Imams within its sanad (chain of transmission). The name of al-Hafiz Ibn Hajar al-Asqalani (d. 852 AH) has also appeared in this sanad. 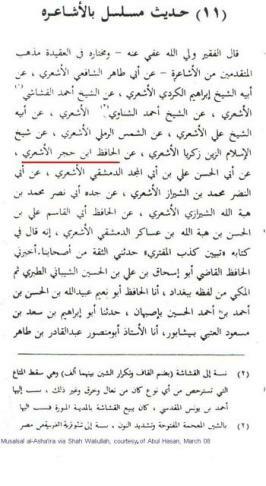 All of this is clear and concrete proof that al-Hafiz ibn Hajar al-Asqalani was an Ashari in aqeeda and this sanad indicates that Shah Waliullah’s own Shaykh in Hadith (Allama Abu Tahir) was also an Ashari as was Shah Waliullah himself. Many of the pseudo-Salafis in the Indian subcontinent who have received asanid in ahadith have chains running back to Shah Waliullah, but they oppose him in many respects like being anti-Hanafi, anti-Sufi and prominently these days, they are anti-Ashari. These are more added proofs of how the pseudo-Salafiyya are truly at odds with the actual methodology of Shah Saheb, (rahimahullah).